Natural wine is a punk movement in a very traditional industry, but what is it and how is it different from conventional wine making? Pete Conway O’Neill from Green Man Wines will lead an evening workshop, tasting bottles from some well known and also more obscure producers of natural wines such as Pheasants Tears, La Stoppa, Domaine Matassa and more. The workshop will include an in-depth discussion on: biodiversity; wild fermentation in the winery; and the difference between conventional, organic and biodynamic farming and their importance to wine production. You will get to taste five lively wines from these producers, along with a few more surprises and of course, some cheese! 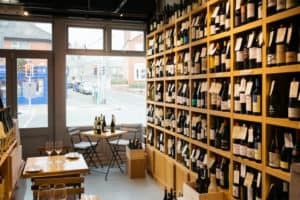 Green Man Wines is one of an exciting new breed of wine shop/wine bar cross-overs that offers customers a chance to taste, enjoy and learn about a diverse range of wines in the company of friends and with good food in a buzzy, community-friendly space in the heart of Terenure, Dublin 6. Recently awarded the Georgina Campbell 2018 Wine Award, Green Man Wines continues to build one of the the most interesting wine selections in Ireland. The ethos is to constantly evolve a range of authentic wines, most of which are made in a lo-fi way and as such reflect the earth and culture in which they are produced very clearly. The business is driven by a small, close-knit team of what could be best described as convivial gastronomes! Pete Conway O’Neill, former cheesemonger with Fallon & Byrne, has just returned from doing a harvest in Roussillon with biodynamic producer Le Soula.